The three drawings that make up the burial series are based on the documentation produced by archaeologists when investigating burial pits. All of the drawings have been made on a 1:1 scale (i.e. they are life size). One drawing represents a cross section, the other three drawings (made on two sheets of paper) represent plan sections. 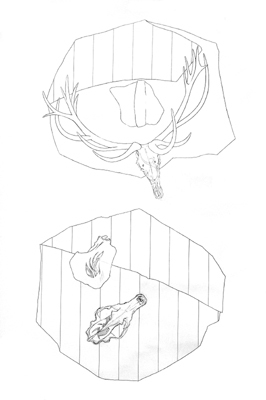 Certain elements that might appear on a published archaeological cross section of this kind (such as a key to explain the patterns describing the various soil and rubble ‘contexts’) have been omitted; my aim is to draw the eye to the subtle suggestions of abstract space that can be perceived within these drawings. Within the plan sections are bones from three animals: hare, stag and bear. Each of these species has maintained a symbolic, perhaps even mystical, relationship with human beings over many millennia. The tribal tattoos that are drawn on these bones are designed to hint at these relationships and suggest the narrative of biological kinship. blackbird, nightingale, song thrush, skylark, bullfinch, nightjar, wren, meadow pipit, sedge warbler and chaffinch. 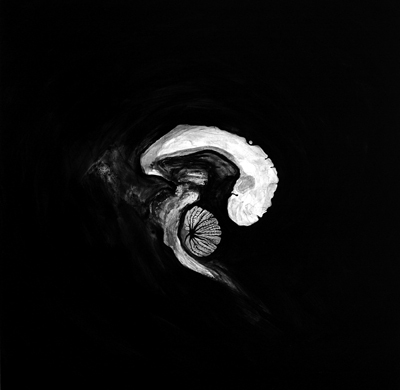 Both the birdsong drawings and the cetacean mri series have been made in response to contemporary neo-darwinist considerations of mind/brain dualism. If the mind is simply ‘what the brain does’ – as has been suggested – then what really distinguishes the human mind from the animal? What are the biological origins of the aesthetic? In the philosopher and musician David Rothenberg’s book ‘Why do Birds Sing’, he is led to the conclusion that standard explanations of territorialism or sexual selection may not be fully adequate; could it be possible that one of the things the brain of a bird (or a humpback whale) ‘does’ is confer pleasure from the joy of its own creations? And taught him songs before his art began. Colin was the name given to an abandoned humpback calf that was discovered in August 2008 at Pittwater North of Sydney, Australia. He attempted to suckle from moored boats in an attempt to obtain food. Despite attempts to reunite the calf with whale pods by luring him out to sea, he returned to Pittwater. Opinion was divided on the best treatment for the orphan whale, some advocating feeding the calf with artificial milk formula, others advocating euthanasia. Colin was finally given a fatal dose of anaesthetic on 22 August 2008 owing to his deteriorating condition. A humpback whale mother and calf, Delta and Dawn, lost on their northern migration, swam into San Francisco Bay in May 2007. Both were injured, most probably from boat propellers. Despite worries from whale watchers, a prolonged sojourn in brackish waters and repeated attempts to encourage their return to the sea, the two whales finally found the right stage of the tide, passing back through the Golden Gate Bridge on their way to the open ocean. Humphrey is one of the most notable humpbacks, twice rescued by the marine mammal Centre and other concerned groups in California. In 1985 he swam into San Francisco bay and then, apparently disorientated, up the Sacramento river towards Rio Vista. 5 years later Humphrey returned and became stuck on a mudflat . He was pulled off the mudflat using a large cargo net with the help of the coastguard. On both occasions Humphrey was successfully guided back to the open ocean using a ‘sound net’ – people in a flotilla of boats behind the whale making unpleasant noises by banging on metal pipes (this is a Japanese fishing technique known as ‘oikami’). At the same time the attractive sounds of feeding humpback whales was broadcast from a boat heading out into the Pacific. Since leaving San Francisco Bay in 1990 Humphrey has been seen only once, off the Farallon Islands in 1991. This exhibition marks the halfway point in my ongoing Leverhulme Trust funded residency based within Cardiff University School of History and Archaeology. The exhibition opened on 10th June 2010 and continues until 19 July 2010. The work in this exhibition has been principally created in response to time spent within HISAR. 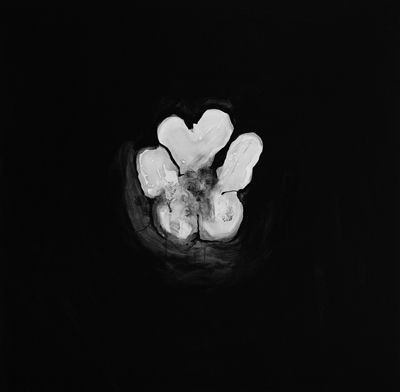 The present outcome consists of three series: cetacean mri, the first, comprises three large paintings based on the brains of humpback whales; songbirds, the second, consists of 10 small drawings on board and burial: three large drawings in graphite on paper. Further reflections on the thought processes that have led to the making of these works can be found in texts that are located close to each respective series. There is also a ‘satellite’ work (entitled Orbit) that directly relates to the work undertaken within the department of Optometry. 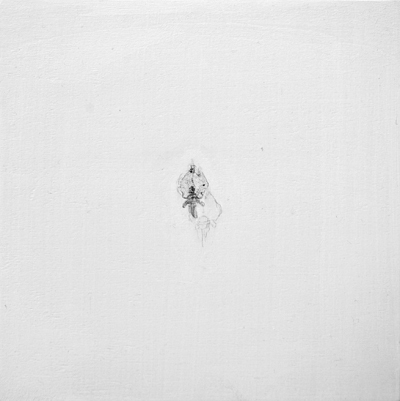 All of these works operate at the fluid boundary that exists between animal and human, culture and nature. I would like to thank the Cardiff University Department of Optometry and Vision Sciences for hosting this exhibition and in particular Professor Tim Wess and Jenni Jones for their enthusiasm, help and assistance. I would also like to thank the School of Archaeology and History for their outstanding hospitality and support during the course of my residency so far. The following people deserve special thanks: Prof. Ian Freestone, Dr. Steve Mills, Laura Henderson, Ian Dennis, Dr. David Wyatt, Anne Brown, Susan Virgo, Niall Sharples, Aled Cooke and Rebecca Blackwell. Last but by no means least I would like to thank Dr Jacqui Mulville for her pivotal role in creating this opportunity for me and for helping, encouraging and spurring me in so many ways over the last few months. You are currently browsing the Exhibitions category at osteography.